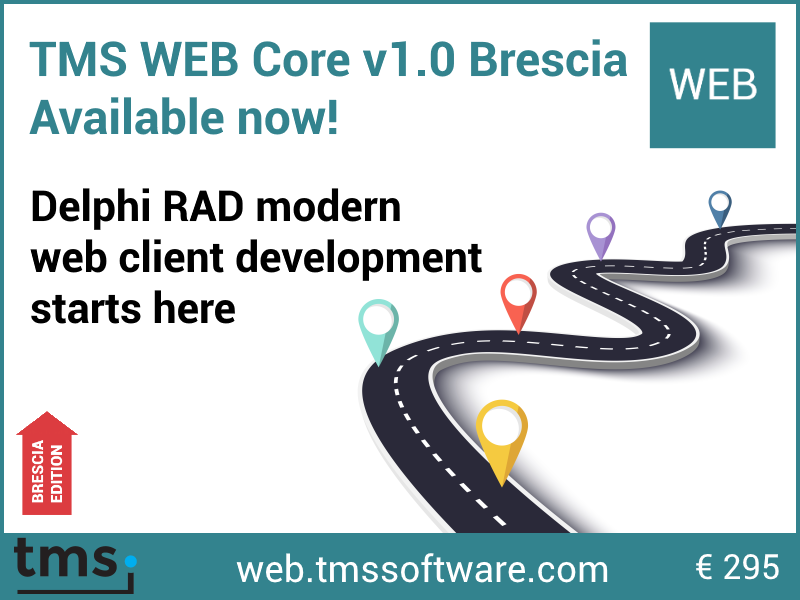 Several months ago, we announced the TMS RADical Web concept to bring RAD component based web development to Delphi. The foundation of this concept is TMS WEB Core. TMS WEB Core enables to build modern web client applications following the single-page architecture that also other modern frameworks like Angular, vue.js, React employ. With TMS WEB Core, you feel right at home in the Delphi IDE, not only with respect to language, code editor, form designer but also with respect to component framework where many direct web-based counterparts are available for edit, button, label, listbox, grid ... and many more UI controls. TMS WEB Core is also to the server technology of your choice. TMS WEB Core web client applications can enjoy first-class binding to data via the familiar TDataSet concept via our TMS XData REST API server technology. But you can use at the same time Embarcadero RAD Server, a node.js based REST API, ASP.NET Core microservices etc..
And we did more magic with TMS WEB Core and the TMS FNC framework. We did nothing less than web-enable our FNC component architecture. That means that our FNC UI controls that were already usable for VCL Windows application development, FMX Windows, macOS, iOS and Android development and LCL Windows, macOS and Linux/Raspbian development can now also be used to develop web applications. This incredible technical wizardry has never been done before. Now you can share Delphi code between desktop, mobile and web applications, including user-interface logic as our FNC controls are 100% code interface compatible between VCL, FMX, LCL and now also WEB with TMS WEB Core. The development of TMS WEB Core took almost 1.5 years so far with a team of over 10 people and was the biggest effort ever in the history of our company TMS software. Never before have so many talented colleagues and bright minds been at work together on this exciting new development. Never before have we been so passionate about a new product. Discover more about the team wizards in upcoming blogs. Now it is your time to enjoy the fruits of this hard labor. We wanted TMS WEB Core to be easily accessible & affordable for everyone. From hobbyist, self-employed consultants, small companies, schools, trainers to large companies. Therefore, we have set the TMS WEB Core launch price to only 295EUR for a single developer license. You will not only enjoy this new exciting product, but also get updates & priority support for a full year. After this period, renewals are offered at 70% discount of the new license price. For developers who like to have the convenience of having our full toolbox directly accessible, there is TMS ALL-ACCESS. With TMS ALL-ACCESS you get TMS WEB Core to build your web client applications but also our TMS XData REST API server technology and our full suite of FNC UI controls to enrich your array of UI controls available for your web applications. The world of the web is large, very large. With TMS WEB Core v1.0, we are only at the beginning of a long journey. As the famous Mille Miglia route is one of the most fantastic journeys in the world, we thought it was nice to visualize the journey of TMS WEB Core as part of TMS RADical Web via the route of the Mille Miglia. 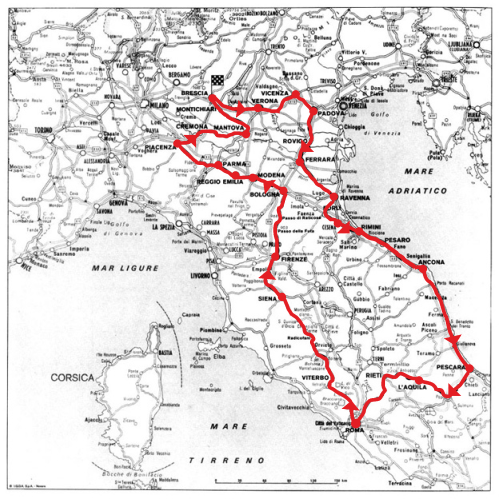 Therefore, it is fitting that this TMS WEB Core v1.0 is named after Brescia, the start of the Mille Miglia and we will follow the track of the legendary year 1955. As you can see, the next milestone is Verona and so the next major release will be called Verona. In a follow-up blog, we will reveal some more details of the roadmap, the milestones of versions you can expect along this famous track. I would say, enjoy this exciting trip and follow with us along the track! A very fine job! Thank you TMS Software. As an all access member, we have been following the progress of product, and we are quite excited about it. Very nice job on the naming as well. I personally found the history lesson provided to be quite enjoyable. "Congratulazioni" on taking the release gold (and taking the checked flag). Congrats! This really opens a new world for Delphi developers, along with the new free Delphi CE, what a great news! I would love to see how it consumes a mORMot backend. and I''ve just checked the demos, I noticed the jQueryWidgets demo works much better than the FUNC demos, for example, in the FNC page control demo, after you clicking on the ''add new tab'' button, all tab headers become invisible until you click again the area where the tab headers are supposed to be located in. I''m using the latest Chrome browser. and do I understand correct that you just clicked the "add new tab button" , right from the tabs to create a new tab? So, I would love to understand how to reproduce so we can investigate. Is there a document describing the language and in particular, the differences between it and current Delphi Object Pascal? Congratulations! Very excited about this new product!!! Congratulations! This is a MILESTONE in web application development! Just received a trial key... Now I know how to spend my holidays! Like Ye Zhihua I''m also interested in consume services from my beloved mORMot servers. Another question is how to (gradually?) integrate into existing SPA written with other frameworks. Congratulations for achieving such a big goal with this new product! It seems like the tail is beginning to wag the dog. Jason - I understand that it is Object Pascal but I currently own ElevateSoft Web Builder and have owned Smart Mobile Studio and both are dialects of Object Pascal. In particular, ElevateSoft''s dialect misses a lot of features in comparison to Delphi which makes it harder to use. We absolutely do not want to have a Pascal dialect. All language support that is already there is fully equal to standard Delphi Object Pascal. Some newer Delphi Object Pascal features like generics or attributes for example are not yet there but are on the roadmap of the compiler team and expected for Q4. Bruno - Thanks for the feedback. Your comment about porting the FNC UI controls is reassuring. Looking forward to trying out Web Core. You''re welcome. Let us know if we can be of any assistance in letting you explore this wonderful new world of web client applications from Delphi. Please don''t waste to much time to develop the compiler because it is hard and a bottomless hole. You should focus to develop the web components! We have a base pascal compiler that is enough! I think the components are the most interesting things for us. With the new components, we can immediately developer the new functionalities or developer faster. You pay for the compiler team and cannot earn the money at once just by this compiler. It is not easy. But you can slowly develop the compiler....Please think about what I said. Thanks! The compiler team has a well defined roadmap. The first is generics support that will be added and this is a much requested feature. This compiler work will not affect in any way the work of the team on UI controls, IDE integration and server-side connectivity. If you have suggestions for the team working on the UI controls, we look forward to hear about it! We have designed TMS WEB Core to be as flexible as possible and to be as open as possible with respect to front-end as back-end. For front-end, TMS WEB Core comes with already quite a lot of UI controls. You can add jQuery controls and a possible option is to use TMS FNC web-enabled controls. That is a free choice to use this type of UI controls or another type. With respect to back-end, it is similar. TMS WEB Core can use a node.js, asp.net core, EMB RAD server, PHP, ... backend and of course also a TMS XData back-end. Of course, as we have full control over TMS WEB Core as well as TMS XData, we can take care to deliver an as seamless as possible integration with the two. The XDataClientDataSet is an example of such seamless integration. But it remains a choice and might depend on the type of server you use or already use. Any chance of a one day hands-on session in Kortrijk ? If so, please announce well in advance as my schedule gets full very quickly. We will inform well in advance, earliest will be 2019 though for something XData specific.